Astronomers developing the Event Horizon Telescope (EHT), a synchronized network of radio antennas with a viewing field as large as the Earth, hope to soon take the first ever photo of Sagittarius A*, a massive black hole at the center of the Milky Way. The amount of data being collected by 10 radio antennas around the globe, often located atop mountains, has forced the astronomers to turn to helium-filled hard drives for their data storage. For example, one of the radio telescopes that make up the EHT array is located 15,000 feet above sea level at the top of the Sierra Negra, an extinct volcano in Mexico. When researchers attempted to collect data using 32 conventional hard drives, 28 of them failed. The Apex antenna, which is part of the Event Horizon Telescope, is located 5,100 meters above sea level, at the Llano de Chajnantor Observatory in the Atacama desert in Chile. "We couldn't use them because the air pressure was so low that the drive heads kept crashing on the hard drive platters," said Shep Doeleman, who directs the EHT project. Doeleman, a professor at the Harvard-Smithsonian Center for Astrophysics/Massachusetts Institute of Technology, said helium-filled hard drives, which are hermetically sealed from outside air, not only solved the low-pressure problem, but also offered far greater storage capacity. 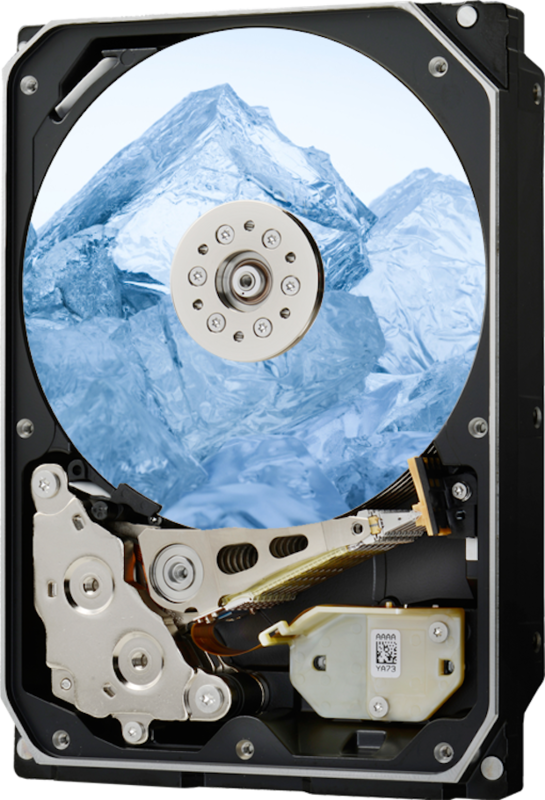 Each of the helium-filled drives from Western Digital's HGST division stores 8TB of data, compared to the 4TB drives the researchers had been using. Hard drive capacity is crucial in that the EHT array collects data at 64Gbps. Over a typical five-day data collection campaign, each radio telescope collects 900TB of data. That data is then stored on from 1,000 to 2,000 hard drives, which amounts to about 7 petabytes (PB) of data total over five days, Doeleman said. 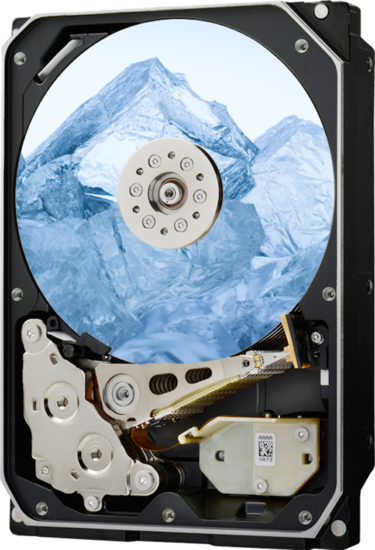 HGST's He10 10TB hard drive seals in helium and user shingled magnetic recording to pack 10TB of capacity into a 3.5-in form factor. Data collected from the EHT array is correlated, and the signal that results is the equivalent to a single focused spot in the black hole. Each year since its first data capture in 2006, the EHT array has moved to add new sites around the world. This year, the project hopes to add telescopes in France, Greenland, the U.S. and the South Pole. Data collected on the hard drives must be transported via jet airliner from the various telescopes to the MIT Haystack Observatory in Westford, Mass., where the images/data are cross-compared and analyzed on a grid computer made of about 800 CPUs all connected through a 40Gbps network. The 800 CPUs use application-specific software to create what Doeleman calls a "silicon lens," a virtual telescope that instead of light, culls the astronomical data samples into a single image that's just gigabytes in capacity. "Here's the interesting thing. All that data that we collect is perfectly useless. It's just noise. We're only recording noise from this black hole," Doeleman said. "The only way it becomes scientifically useful is when we combine it together in that silicon lens." The Haystack VLBI Correlator grid computer at the MIT Haystack Observatory in Westford, Mass. The computer cross correlates data/images from Event Horizon's 10 radio telescopes into a single image. The EHT produces 2,000 times more detail than the Hubble Space Telescope, an optical telescope in orbit around Earth. In a way similar to how an optical telescope collects and concentrates light, the Event horizon Telescope array collects electromagnetic radiation from 10 points around the planet, the data from which is then combined to form a picture -- in this case of the Sagittarius A* black hole. Unlike an optical telescope, which collects light using a parabolic mirror, radio telescopes collect electromagnetic radiation emitted by objects in space. Weighing in at four million times the mass of the sun, Sagittarius A* lies at the center of the Milky Way galaxy, where gas and dust obscure the view in optical light. Radio waves, however, can freely stream from deep within the gravity well of the black hole and travel 25,000 light years to earth. There, the EHT uses the largest and most sensitive radio dishes on Earth to capture signals from the event horizon of Sagittarius A* using custom built high-speed data recorders. The Event Horizon Telescope is made up of radio telescopes around the world that together create a single image of whatever they're pointed at. In this case, the telescopes are focused on collecting noise emitted from Sagittarius A*, a massive black hole at the center of the Milky Way. The goal of the EHT is to create the first image of a black hole boundary, known as the event horizon: the point at which the force of gravity is so great, even light cannot escape. While light may not be able to escape, black holes found at the center of every galaxy are some of the brightest objects in the universe. That's because light can be seen as an aura or glow around them as matter is sucked in at many times the speed of light, which super heats it to hundreds of millions of degrees. EHT's data collection technique, known as Very Long Baseline Interferometry (VLBI), cross-references recordings of the Milky Way's black hole from across the Americas, Antarctica, Hawaii and Europe, and will soon be capable of rendering a visual representation of the anomaly, according to Doeleman. By resolving the shadow cast by the black hole against the hot gas falling inwards, the EHT will be able to test theories set forth by Albert Einstein, and for the first time visually capture an image of a black hole. "Black holes have been theorized for many, many years," Doeleman said. It was 100 years ago that Albert Einstein wrote his 10 "field" equations making up his theory of general relativity. German physicist and astronomer Karl Schwarzschild then provided the first exact solution to the Einstein's field equations of general relativity. Schwarzschild's name became the namesake for the Schwarzschild radius (or gravitational radius), which describes the mass of an object that is compressed within a sphere to a singular point so that the escape velocity is equal the speed of light -- i.e., a black hole. The Combined Array for Research in Millimeter-wave Astronomy (CARMA) is comprised 23 radio telescopes that are also a part of the Event Horizon Telescope array. "Even Einstein didn't believe you could make a black hole. He thought it was a mathematical curiosity, as did many people," Doeleman said. "Recently, we've begun to understand there are supermassive black holes, like the one at the center of our galaxy, at the center of all galaxies. In other words, imaging black holes will help scientists understand astronomy on large scales, such as how galaxies form. "Black holes are part of an astronomer's every day experience, as well as a physicist's and mathematician's every day experience, but no one has ever seen one," Doeleman said. "So there's this immense elephant in the room. Do they really exist and can we see one in action."